Welcome to Identity.com, where we’re changing the way the world thinks about identity with the latest blockchain-powered technology. We call this the New Identity Economy. Identity is a fundamental part of daily life, and merging blockchain technology with identity is a complex undertaking. Yet identity is one of the most essential layers for mainstream blockchain adoption. emphasizing the value of identity verification, not the exchange of personal information. We see Identity.com playing a big role in the future of identity, but decentralized identity is bigger than an identity ecosystem. Transforming the way we prove who we are requires collaboration from a global community. In the hopes of helping more people understand why what we’re doing is so impactful, this beginner’s guide will break down Identity.com in non-technical terms. Validators are the foundation for the Identity.com ecosystem. They are the entities that can validate information related to a User’s identity. The Identity.com probably aren’t much different from Validators that you’re using today, ranging from banks and cell phones providers to specialized identity verification companies and government agencies. Requesters are the customers of the ecosystem. Requesters are the entities that need to verify information related to a User’s identity before offering access to a product or service. A Requester could be a bouncer who needs to know someone is over 21, a leasing agent who needs to run a background check before renting to someone, or a border agent checking travel credentials. Users are the beneficiaries of the Identity.com ecosystem. All interactions and transactions are initiated by the User. 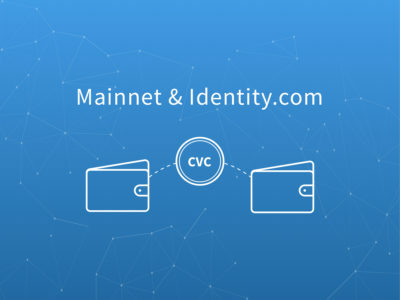 They have access to a secure mobile app that acts as their Credential Wallet, like the Civic App or other apps that implement the associated Identity.com toolkit. All Identity.com interactions are initiated by a User. Imagine that a User wants to apply for some service or register with a vendor. Let’s take logging into a gambling website with the Civic App as an example. Gambling is age restricted so a User needs to prove they are 21+ years of age to access the website. The Requester, in this example, is the gambling website. When a User arrives at the gambling website, they are prompted to verify they are over 21 years of age. Instead of entering a birthdate or registering with the website, the User simply scans a QR code on the Requester’s website with the Civic App. This QR code tells the User’s app two things: the kind of verified credentials that the Requester requires and the Validators that the Requester will accept verified credentials from. A verified credential is simply a credential, like an address, a birthdate, a social security number that has been validated by a Validator. If the User already has the verified credential stored on their mobile device, they can share with a Requester immediately. If not, the User will need to get their credentials validated by an approved Validator, which usually takes a matter of minutes. When the User has the required verified credentials, they can share with the Requester. 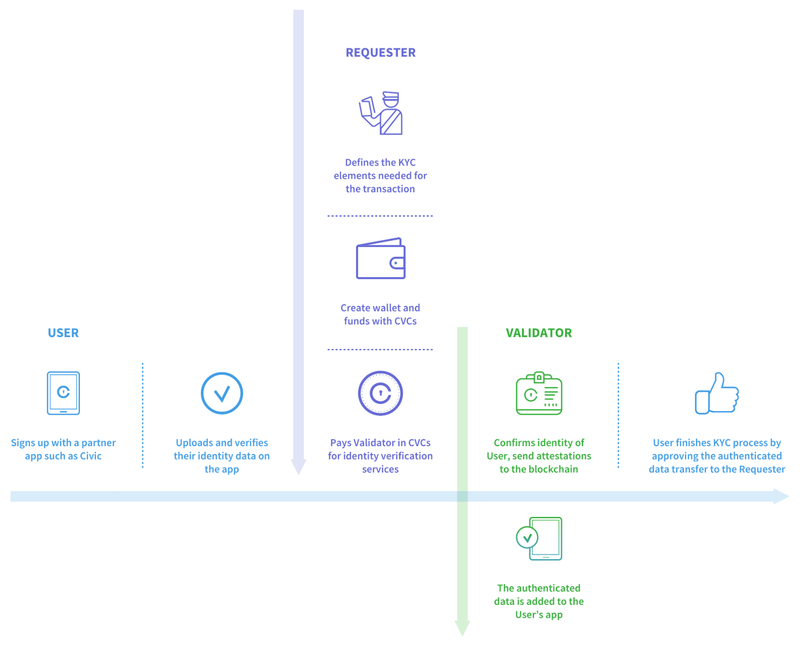 When a User shares a verified credential with a Requester, the Validator is paid by the Requester for their validation in CVC tokens. Users never pay for identity verification. Additionally, Requesters and Validators never interact directly, so this payment is the result of escrow accounts and smart contracts. This is why CVC tokens are critical to the marketplace economy. If you want a non-technical explanation, feel free to read more in our Token Behavior Model White Paper. Once this interaction is done, all the verified credentials continue to live on a User’s mobile device, and these verified credentials can be reused. 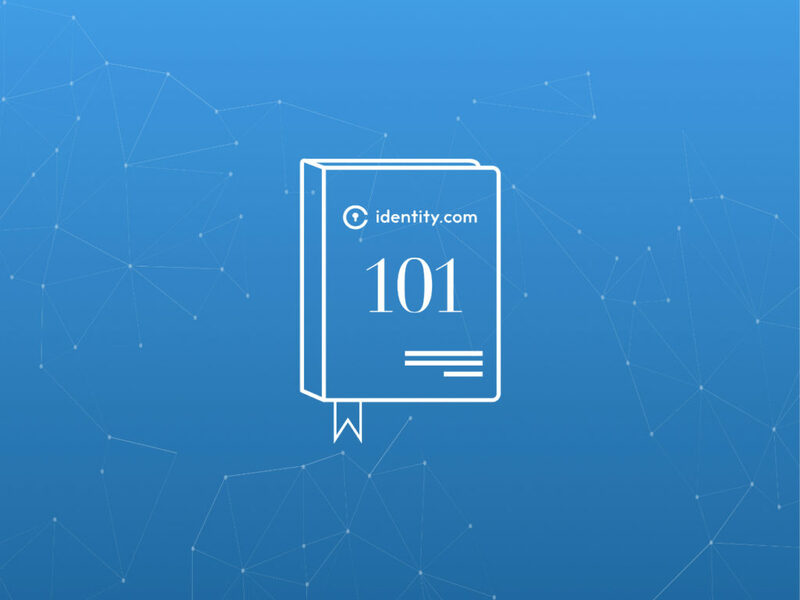 This reusability is what help simplify and streamline the identity verification process. If multiple Requesters need the same verified credentials, there is no need to get go through multiple rounds of identity verification. The Civic App is used as an example because Civic is currently the only company operating in the Identity.com marketplace. However, in the future, the Civic App could be any company that decides to develop on the Identity.com marketplace. The Identity.com ecosystem is an open source platform that will be open for external development in 2019. 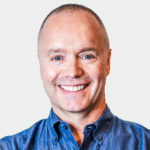 Civic and Identity.com are similar to the relationship between Redhat and Linux. Civic provides a service for Requesters to integrate on Identity.com without needing to interact with blockchain directly, enabling less technical development and integration. Identity.com is decentralized by design. This means that anyone can leverage Identity.com without the need to go through a central authority or managed service. All ecosystem participants are in control of how information is shared and who they choose to engage within the identity verification marketplace. Most importantly, the decentralized design enables User information to be stored locally on a mobile device. 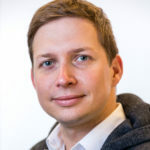 Identity.com will be governed by applications of game theory and smart contracts, rather than a central body. How exactly does this work? 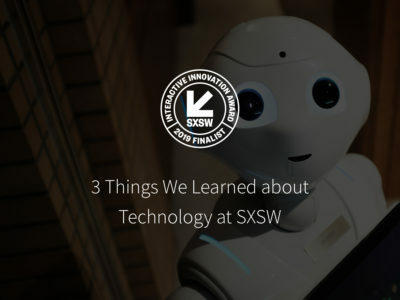 There will be automated processes and incentives for good behavior and bad behavior. If it’s more expensive to be bad than it is to be good, all rational actors should try to play by the rules in the platform resulting in a trustworthy, growing ecosystem. Identity.com is also open source by design. This sentiment is rooted in the belief that no one company should own identity. Interacting with a decentralized blockchain can be challenging, and open-sourcing these layers, like libraries, toolkits, and smart contracts, makes it easier for other organizations to leverage Identity.com. You can read more about our decision to open source Identity.com here. Any organizations that want to develop on top of Identity.com and leverage the identity verification infrastructure is welcome to build or connect their own identity solutions. At Identity.com, we envision a world where everyone has a digital identity that they control. That goal requires that we completely transform the way we think about identity, and it requires a community that shares these values. That is why we created the Identity.com platform.